It’s a beautiful peacock statue that I saw in the garden of Kamay ni Hesus in the front of Noah’s Arc in Lucban, Quezon. It looks realistic because of the beautiful color of the feather. Vince sitting in the peacock statue even it is hot because of the weather condition. Right away I was took a photo for her. tita mona next time nalang biglaan lang hehe!! This is a very nice picture! He looks very cute. How cute! We were also supposed to go to Lucban, also to go to Kamay ni Hesus. Unfortunately, there were sudden changes in schedule and we weren’t able to go. 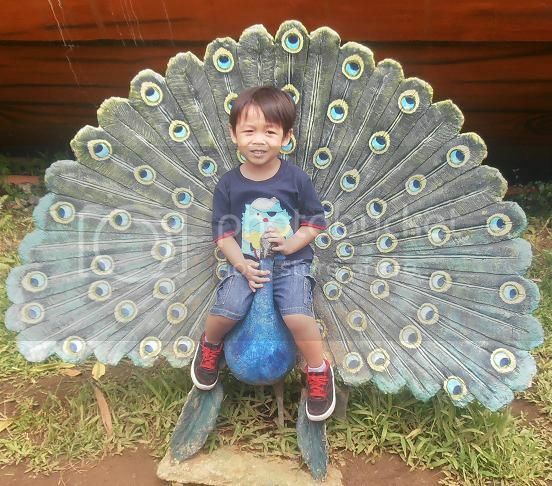 I’ll look for this peacock when we do finally visit the place.